to memorialize your pet or to mark a special occasion or remembrance of a friend or family member. Celebrate an anniversary, birthday, or other special occasion. Memorialize a loved one in your personal space away from the cemetary, or set in stone a tribute to your pet's lifetime of unconditional love. Or simply cast a personal motivating message to remind you of something special to keep in your heart. The optional urn offers a unique and safe way to memorialize a beloved pet's remains. The urns are designed to be buried in the ground with the attached personalized memorial stone sitting above grade. 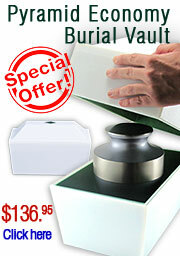 The urn is made of strong and durable PVC and is water-tight once it is permanently sealed.